1. 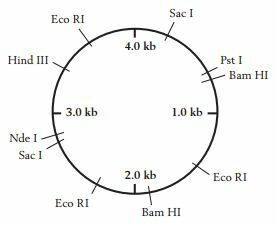 The table shows the restriction enzyme recognition sites present on a circular piece of DNA 4.0 kilobases (1 kb = 1,000 bases) long. Which pair of restriction enzymes, used together, would produce a band that travels the farthest on an electropheresis gel? 2. Which of the following is generally identical in all the somatic cells of an organism? 4. Animals store energy in which of the following molecular forms? 5. In which phase of the cell cycle does DNA replication take place? 6. In eukaryotic cells, chromosomes and ribosomes share which of the following characteristics? I. They consist of nucleic acid. II. They consist of protein. III. They are in the nucleus. 7. Which of the following is a macromolecule composed of amino acid subunits? 8. The diagram depicts the movement of an amoeba. Which cellular structure is responsible for the amoeba's movement? 9. Where do the reactions of the Calvin cycle take place? 11. A codon on the coding strand of a gene is shown below. Which anticodon sequence will bind to the transcribed codon? 12. Which statement describes one difference between hormones and neurotransmitters? A. Hormones modify cellular activity. B. Hormones are secreted into the bloodstream. C. Hormones produce a change in animal behavior. D. Hormones attach to receptors on the cell surface. E. Hormones are released in response to external stimuli. 13. The antibiotic tetracycline works by binding to rRNA in prokaryotes. Which cellular activity does tetracycline directly disrupt? 15. Scientists grew E. colibacteria in a nutrient solution containing a heavy, stable isotope of nitrogen, 15N. They then transferred them to a medium with the more common light isotope of nitrogen. Periodically, DNA from the cells was extracted and subjected to density centrifugation. The strain of E. coliused divides once every 20 minutes. The results are illustrated below. At which time point(s) is the heaviest DNA extracted from the cells? 16. Scientists grew E. colibacteria in a nutrient solution containing a heavy, stable isotope of nitrogen, 15N. They then transferred them to a medium with the more common light isotope of nitrogen. Periodically, DNA from the cells was extracted and subjected to density centrifugation. The strain of E. coliused divides once every 20 minutes. The results are illustrated below. After two cell divisions, what types of chains make up the DNA of the cells? 17. Scientists grew E. colibacteria in a nutrient solution containing a heavy, stable isotope of nitrogen, 15N. They then transferred them to a medium with the more common light isotope of nitrogen. Periodically, DNA from the cells was extracted and subjected to density centrifugation. The strain of E. coliused divides once every 20 minutes. The results are illustrated below. If the scientists were to continue extracting and centrifuging DNA every 20 minutes, which result would describe the DNA bands in the test tubes? A. The top band would move lower, while the middle band would disappear. B. The top band would grow thinner, while the middle band would grow thicker. C. The top and middle bands would both grow thicker and move lower in the tube. D. The top and middle bands would both grow thicker but remain at the same level. E. The top band would grow thicker, while the middle band would remain the same. 18. Scientists sequenced a portion of the aspartate transaminase enzyme from different species. The amino acid sequences are shown in the table. Each letter stands for an amino acid. Differences from the human sequence are indicated by bold letters. Missing amino acids are indicated by a dash (–). 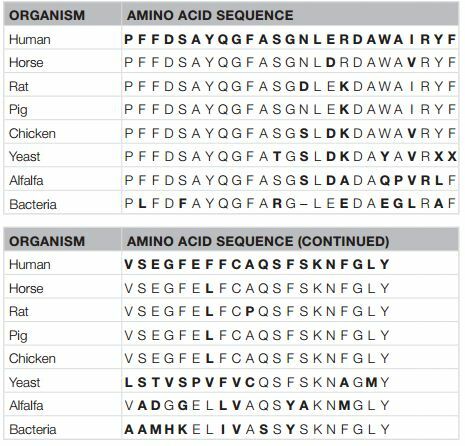 Which pair of organisms is most similar in terms of the amino acid sequence shown? 19. Scientists sequenced a portion of the aspartate transaminase enzyme from different species. The amino acid sequences are shown in the table. Each letter stands for an amino acid. Differences from the human sequence are indicated by bold letters. Missing amino acids are indicated by a dash (–). 20. Scientists sequenced a portion of the aspartate transaminase enzyme from different species. The amino acid sequences are shown in the table. Each letter stands for an amino acid. Differences from the human sequence are indicated by bold letters. Missing amino acids are indicated by a dash (–). Which genetic mutation occurred farthest back in time?